The chair first appeared in July 1899 when it was presented out of the blue to the Musée Carnavalet by a woman who refused to give her name but identified herself as Couthon's great-granddaughter. She claimed that it had been in store with the family furniture ever since Couthon's execution on 9th Thermidor. There is one other piece of information. 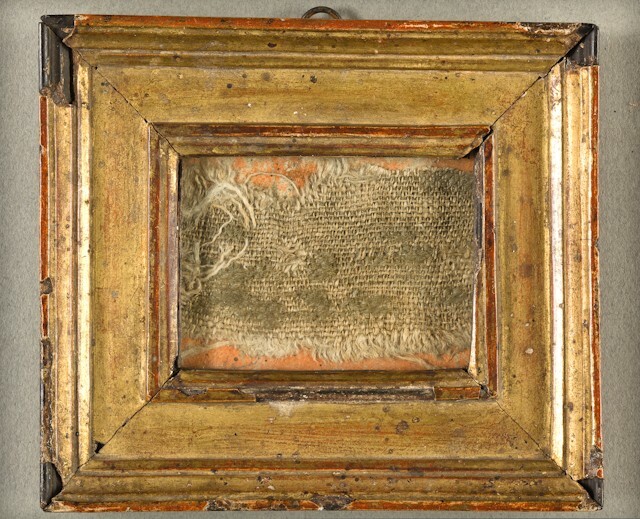 The Archives nationales contains (or contained) a letter dated Messidor, an III (9th July 1795) which stated that représentant Couthon had been officially loaned from among the effects of the comtesse d'Artois at Versailles a curious moving chair ("un fauteuil élastique assez curieux") which was now in the Garde-Meuble, place de la Révolution. Presumably this was the same chair - though why the comtesse d'Artois had owned a wheelchair is not clear since she was not herself an invalid. Did Couthon use the wheelchair? The image of Couthon clattering around in his wheelchair in the Convention and the committee room is a tempting but possibly inaccurate one. He probably only received the loan in February or March 1794 and there is certainly no evidence that he used a chair prior to this. Although he suffered from a chronic and deteriorating condition - polio or some form of tuberculosis or meningitis - he was certainly not completely paralysed, at least until the very end of his life. In October 1791, when he first came to Paris as a Deputy to the Legislative Assembly, he lodged nearby with his colleague Soubrany "chez M. Girot, rue Saint-Honoré, almost opposite the Capucins" and was able to walk to the assembly "with the aid of a stick or two crutches". By May 1792 his legs had worsened but there was still no wheelchair: instead he writes "when my pains allow me to go to the Convention, I am obliged to have myself carried right into the sanctuary"; a report mentions his "gendarme", suggesting that someone was perhaps officially assigned to the task. His address at this time was closer still, at no.97 cour du Manège. In 1793, at the height of the Terror, Couthon was still strong and active enough to be sent out en mission, first to his native Puy-de-Dôme and then to reek vengeance on the defeated counter-revolutionaries of Lyons. According to R.R. Palmer, on 2nd October 1793, the "nimble general", as he jokingly called himself, was helped by his wife from a carriage at the village of Sainte-Foy just outside Lyons. A few days later he entered the city. On 12th October, following the final defeat of the rebels, came the fateful decree from the Convention ordering Lyon's total destruction. 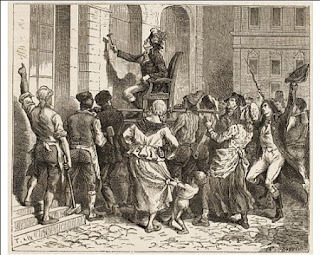 Famously, on 26th October Couthon had himself carried "in an armchair" around the Place de Bellecour where he struck the houses with a silver hammer to symbolise their imminent demolition. He was strong enough to hobble to the rostrum to address the Lyonnais and is usually depicted on this occasion as being borne by sturdy sans-culottes - again no sign of a wheelchair. Even after Couthon's final return to Paris his use of the wheelchair is by no means certain. It is not entirely clear where he actually resided in his last months. According to Lenotre, a report mentions a "habitation in Passy and one which he had near the baths, a short distance from the Pont Neuf" but he is also placed in 343 rue Saint-Honoré in an apartment next to Robespierre's. Do we really envisage him trundling to the Convention? In the Tuileries both the hall of the Convention and the notorious green room where the Committee of Public Safety met had inconvenient flights of steps. Historians unravelling the confused events of 9th/10th Thermidor often have Couthon toppling or throwing himself from his wheelchair down the steps of the Hôtel de Ville at the same time as Robespierre's suicide attempt, but the idea that he was moved around Paris in this contraption seems improbable. If it was really with him at the end, how come it turned up eventually not in the official depository but among the family furniture? R.R. Palmer, Twelve who ruled. Princeton University Press, 1969. 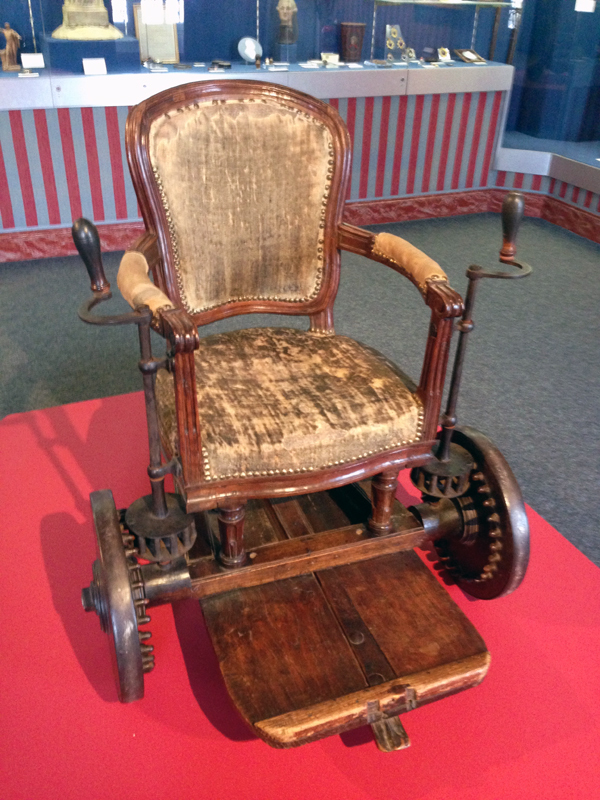 G. Lenotre "Couthon's bath-chair" in Romances of the French Revolution. English translation (1909) vol. 2, p.168-180. Augustin Cabanès, "L'infirmité de Couthon" in Le cabinet secret de l'histoire (1905). vol. 3, p.225-280. See p.260 for the letter concerning the wheelchair.